For most organ players, it’s not surprising that there is a complete line of specialized clothing and gear just for playing the organ. But newer players, and those only passingly familiar with the pipe organ, are often surprised to find that there is a shoe designed solely for playing the organ. But what are these special shoes and how are they different from regular shoes? Read on to find out more. While some organ players choose to use plain dress shoes while performing, many other organists chose to use organ shoes instead. These specialty shoes use a unique design and certain materials that make them ideal for working the foot pedals of the organ. Perhaps the most interesting part of an organ shoe is the construction of the sole. Typically, the soles of shoes are fairly thick so that they do not wear out quickly. Often, these soles are made from leather or rubber to make walking on them comfortable. Organ shoes, however, are very thin, and they are coated in suede. These features allow the organist to quickly move their feet between the floor pedals, as the suede helps them to glide over the surface of the pedals. The thin soles allow the organist to better feel the pedal itself, which removes an element of guesswork when moving between pedals. Playing the foot pedals of an organ requires quick and precise movements and also keeping your feet fairly close together. This means that organ shoes are typically narrower than regular shoes. So when an organist needs to play two foot pedals that are right next to each other, they can do so without crowding their feet. 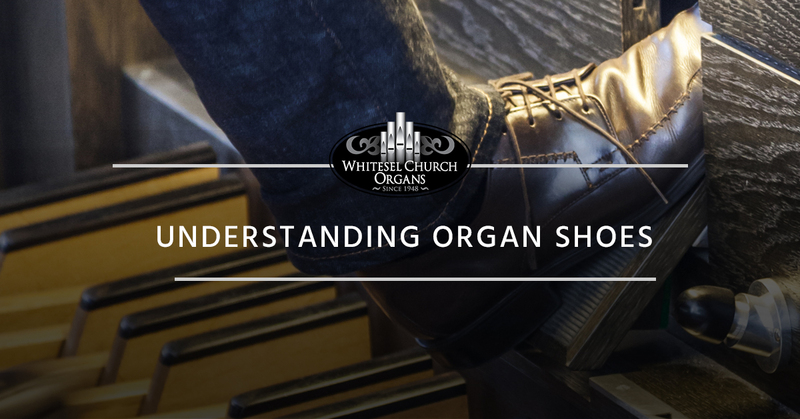 While many organists might enjoy the extra height they gain from the heel of their organ shoes, the heel actually serves an important purpose. The pronounced heel makes it easier to play the flat pedals of the organ. Because the heel is far thicker than the sole of the shoe, organists can use both their heel and their toe of the same foot to play two different pedals, known as the heel-toe technique. Why Not Use Plain Shoes? Organ shoes are designed deliberately to enhance the organists performing ability. Other shoes, be they dress shoes or tennis shoes, have features that make them ill-suited for organ playing. The soles of your tennis shoes are designed with traction and grip in mind. While this is great for walking around town or going for a run, this makes them a poor choice for playing the foot pedals of an organ. Your feet won’t be able to move as quickly between the pedals, and built up dirt in the textured rubber soles may scratch and damage the tops of the pedals. The suede on the bottom of the organ shoes keeps from damaging the pedals. Dress shoes often have a far stiffer and thicker sole, making it difficult for organists to determine which pedal they’re pressing until the note has been played. The thin soles of an organ shoe prevents this confusion. Top-tier organists need top-tier equipment to perform their best work. That’s why Whitesel Church Organs is proud to carry Viscount Organs. Whether you need a digital organ or a hybrid, we offer the right organ for your performance needs.